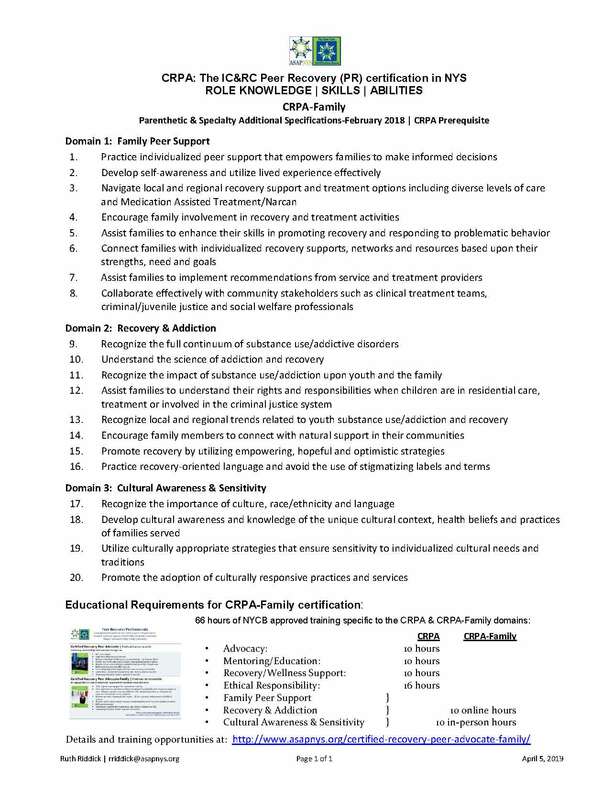 CRPA-Family launches in May, reimbursable on July 1. Please note that all applications take 4-6 weeks to process. Please see below for detailed Application Instructions. 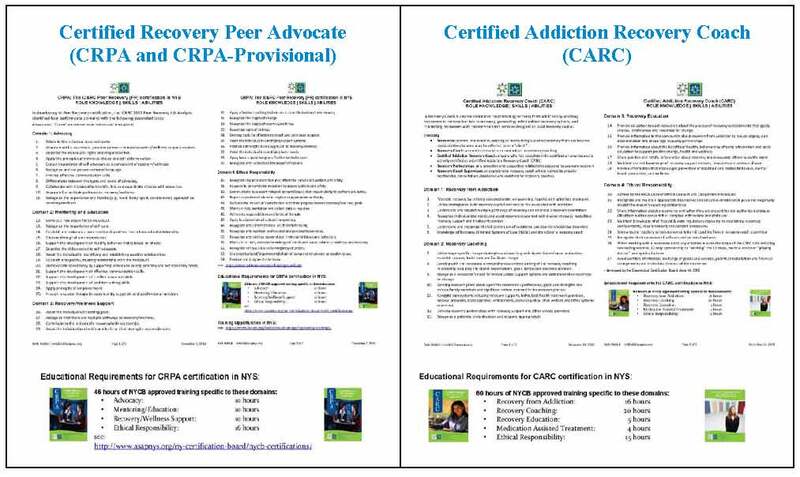 Please note that CRPA and CRPA-Provisional are separate certifications. You are not automatically CRPA-Provisional if you’ve applied, and are waiting, for CRPA. 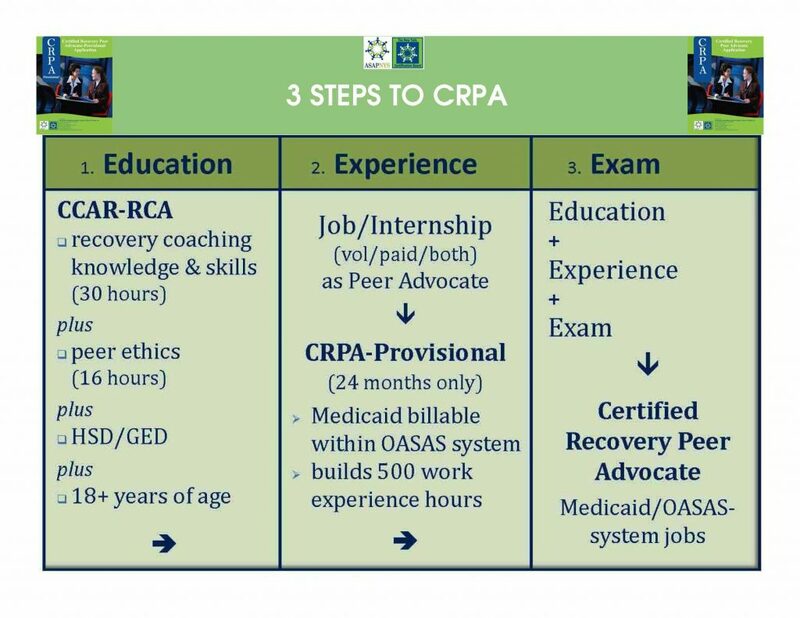 You will need to apply separately for the certification that’s right for you: CRPA-Provisional is for you if you’re already working in the role, and need to be Medicaid reimbursable through your agency, but you haven’t yet completed 500 hours work experience. If you already have 500 hours work experience, you may skip this first step and apply now for CRPA. For CARC Application Instructions, scroll below. 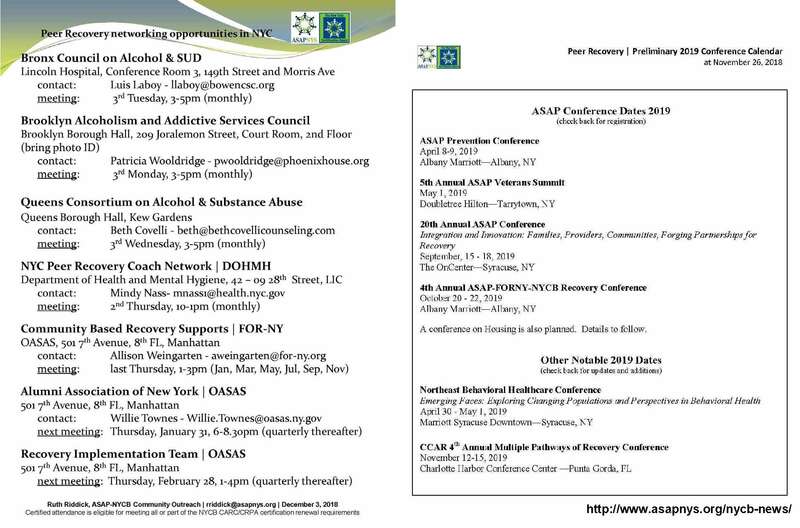 Please note that all partial certification applications “time out” if they haven’t been completed after a year. Complete the CRPA Scholarship application form to cover associated fees (click here for details). Click here to submit your scholarship application form. 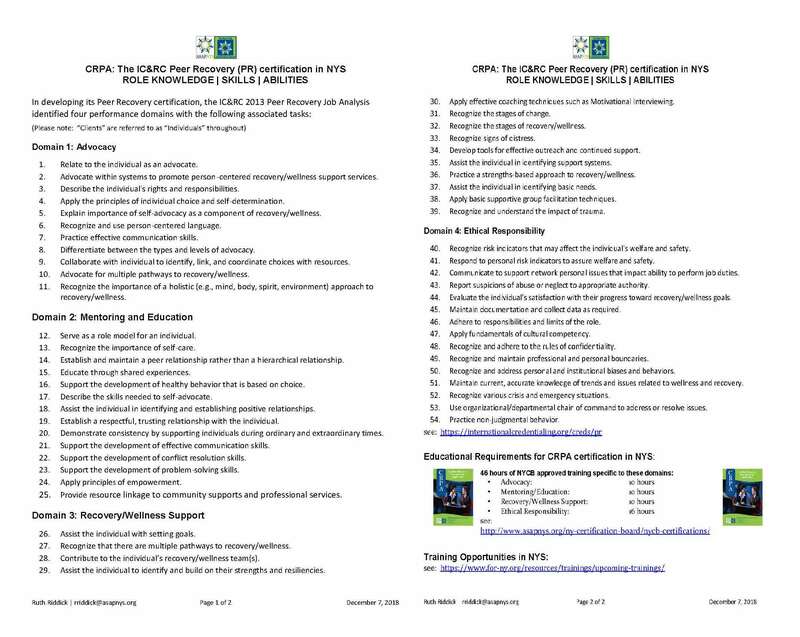 Complete the CRPA Certification Application form available here. 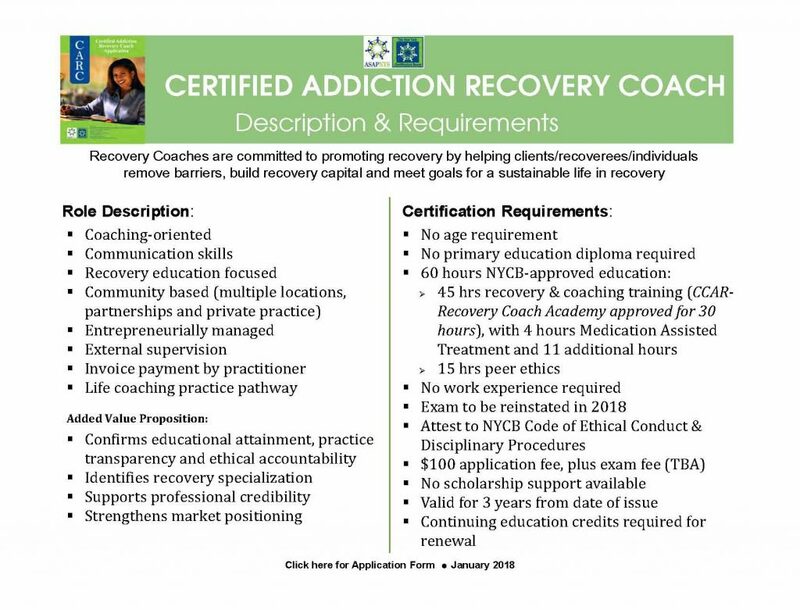 This application includes a Work Verification Form (page 6), which is to be filled out and signed by your supervisor, confirming that you’ve completed at least 500 hours of work/volunteer experience in the non-clinical peer role, including 25+ hours of supervision. As soon as your application is received, it is reviewed by two staff members to confirm that it meets the standard for CRPA certification. If the application is incomplete, you will be contacted by email with instructions on how to complete your application. When complete, your application will be sent to the NYCB Board for approval. 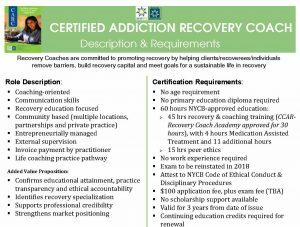 Once approved by the Board, and the exam fee has been received, you will be pre-registered with the examining organization, the International Credentialing & Reciprocity Consortium (IC&RC), for the Peer Recovery exam. You will receive instructions directly from IC&RC about how to schedule a time and place to take the exam. Please click here to review exam preparation materials on the IC&RC website. 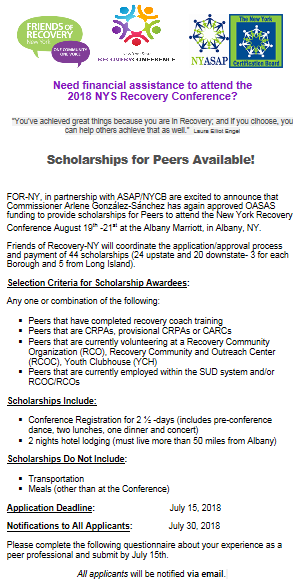 Please click here for details of the free ASAP-NYCB Peer Recovery Exam Prep Workshop. 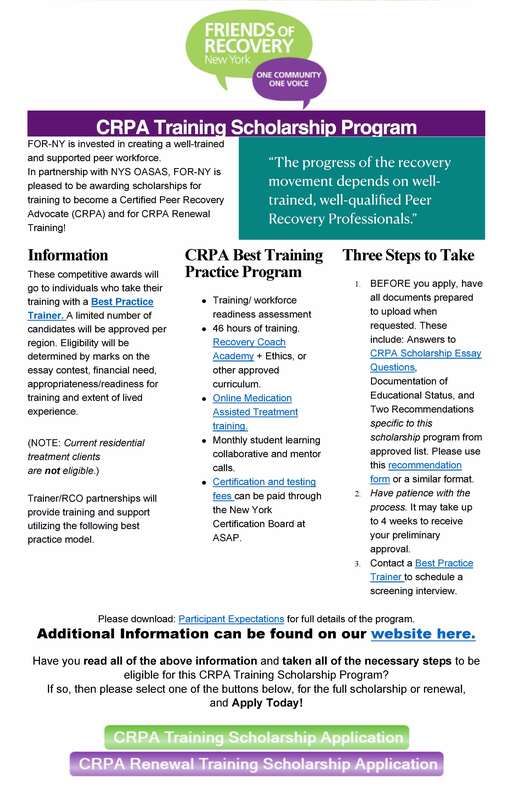 When you pass the exam, NYCB will email your CRPA certificate. If you do not pass the exam, NYCB will email a notice with insstructions on how to reschedule. You will be invited to retake the exam no earlier than 90 days following the unsuccessful attempt. 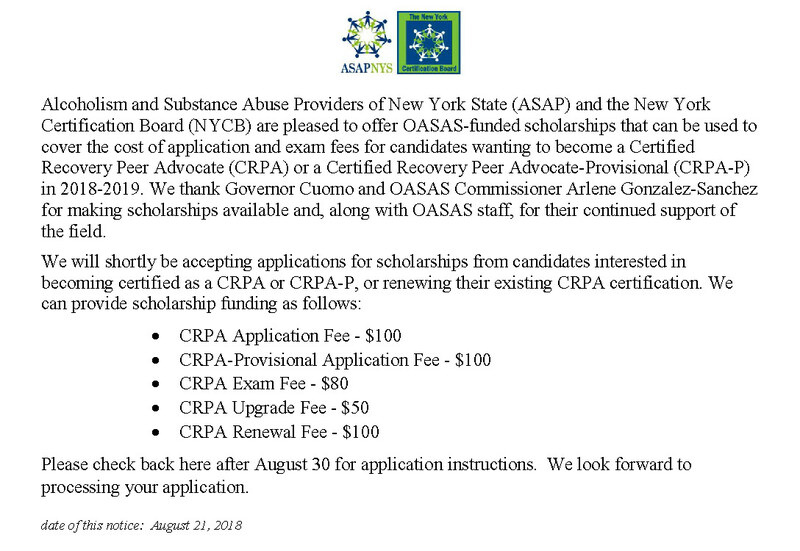 An additional fee of $80 fee is required to retake the exam. Scholarships do not apply to rescheduled exams. If you do not show up for the exam, you will also be required to pay the $80 exam fee again to reschedule. Scholarships do not apply to rescheduled exams. Your CRPA certification dates from the 1st of the month and is valid for 3 years from that date. 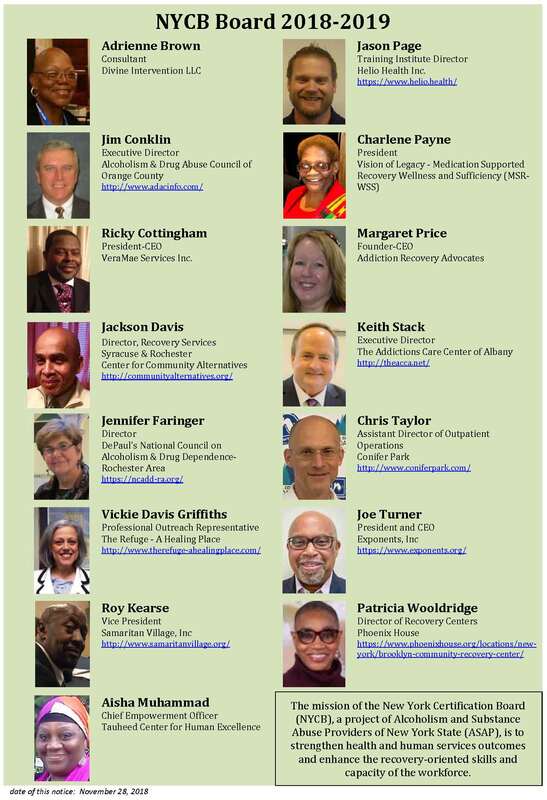 Please click here for details of certification renewal standards/requirements and procedures. Please note that your services become Medicaid-billable by your employer from the date of certification (CRPA-Provisional and/or CRPA). Individuals do not bill Medicaid. Complete the CRPA Scholarship application form to cover associated fees (click here for details). Click here to submit your application form. Complete the CRPA-Provisional application form available here. This application includes a Work Verification Form (page 6), which is to be filled out and signed by your supervisor, confirming that you’re currently engaged in the non-clinical peer role, whether as a volunteer, an intern or an employee (or a mix). 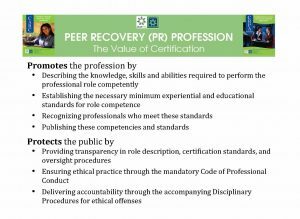 As soon as your application is received, it is reviewed by two staff members to confirm that it meets the standard for CRPA-Provisional certification. If the application is incomplete, you will be contacted by email with instructions on how to complete your application. When complete, your application will be sent to the NYCB Board for approval. 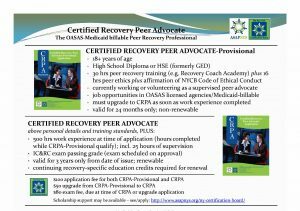 Once approved by the Board, NYCB will email your CRPA-Provisional certificate. 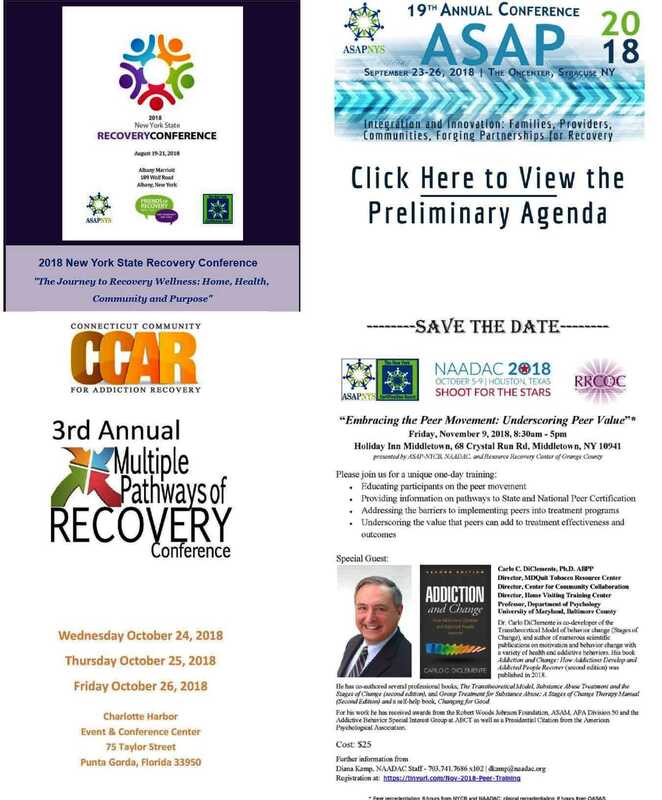 Once your CRPA upgrade is approved by the Board, and the exam fee has been received, you will be pre-registered with the examining organization, the International Credentialing & Reciprocity Consortium (IC&RC), for the Peer Recovery exam. You will receive instructions directly from IC&RC about how to schedule a time and place to take the exam. Please click here to review exam preparation materials on the IC&RC website. 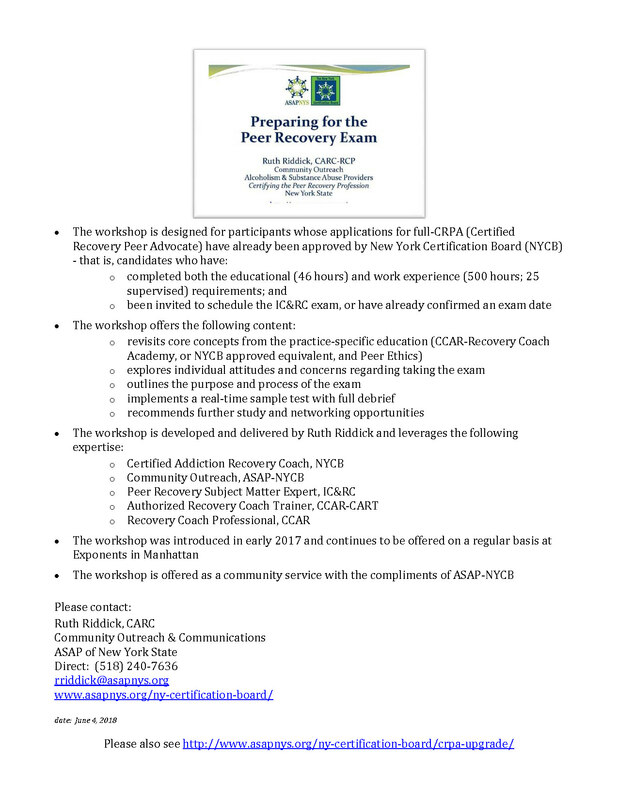 Please click here for details of the free ASAP-NYCB Peer Recovery Exam Prep Workshop. 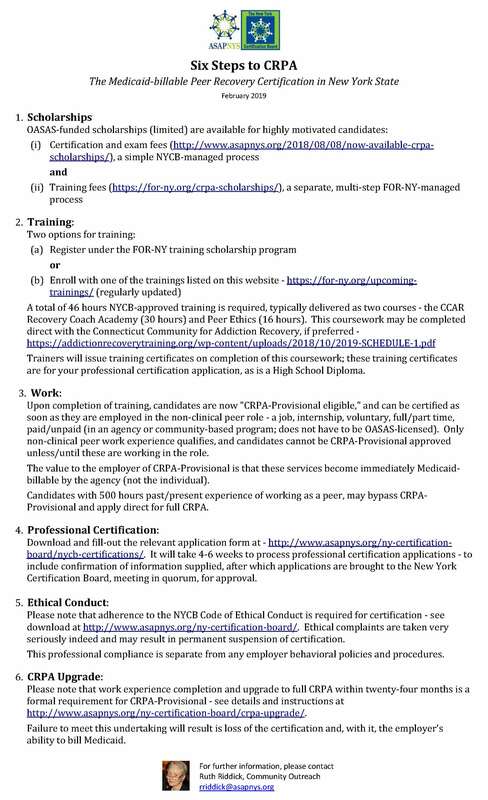 When you pass the exam, NYCB will email your CRPA certificate. If you do not pass the exam, you will be invited to retake it in three months (90 days). An additional fee of $80 fee is required to retake the exam. If you do not show up for the exam, you will also be required to pay the $80 exam fee again to reschedule. 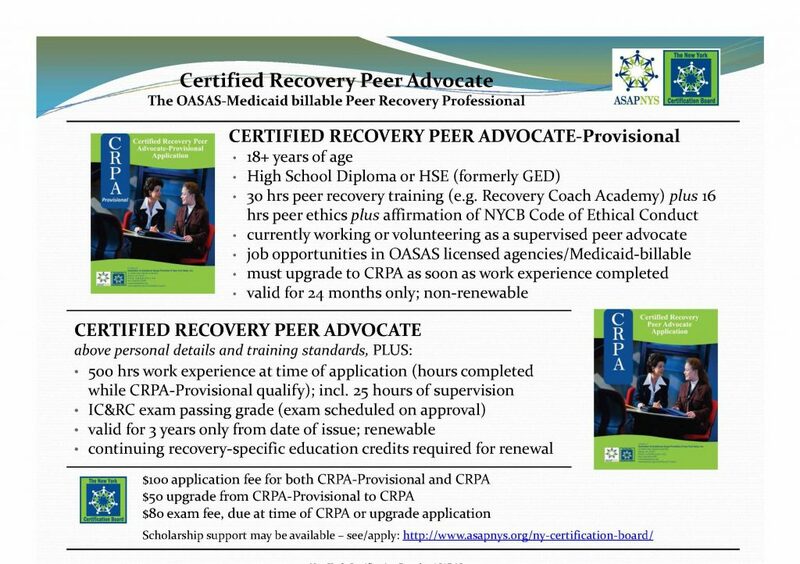 Your CRPA certification dates from the 1st of the month and is valid for 3 years. 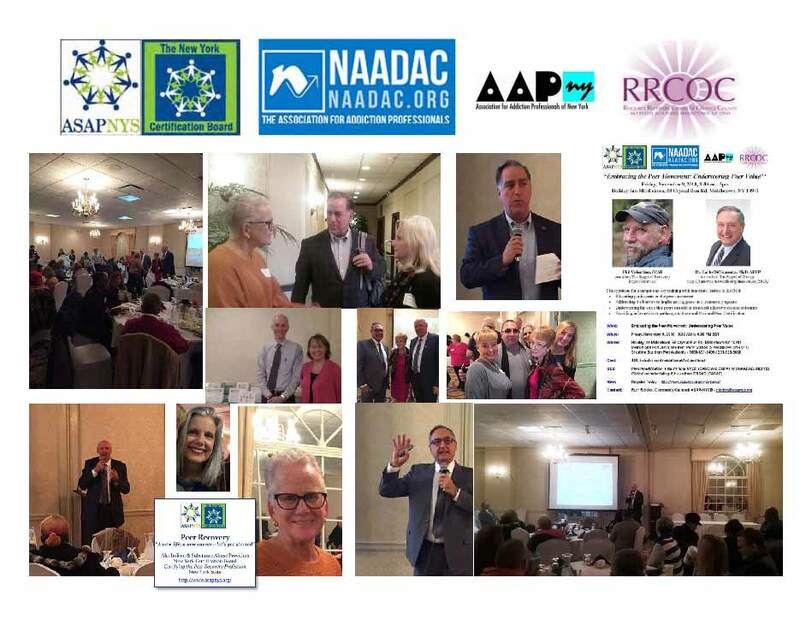 Please click here for details of recertification standards and procedures. Please note that your services become Medicaid-billable by your employer from the date of certification (CRPA-Provisional and/or CRPA). Complete the CARC application form available here. 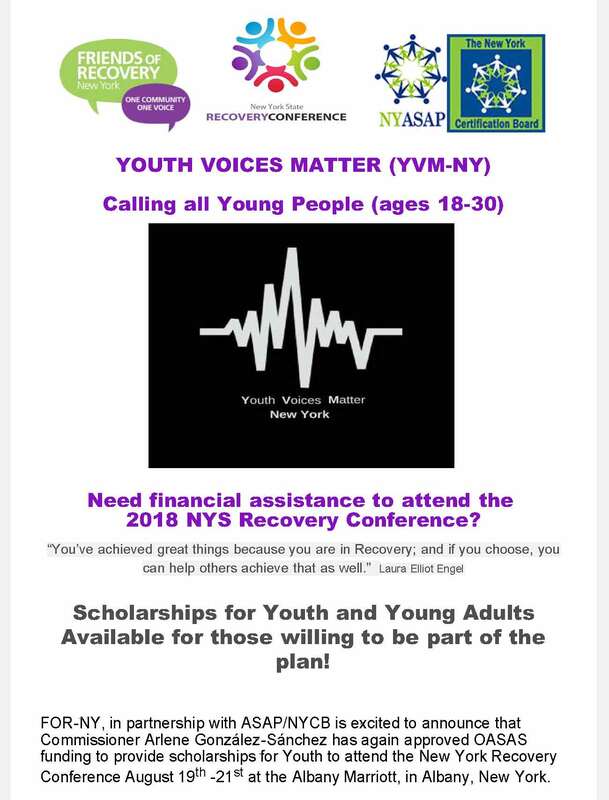 Check/money order made payable to NYCB for the $100 application processing fee. As soon as your application is received it is reviewed by two staff members to confirm that it meets the standard for CARC certification. If the application is incomplete, you will be contacted by email with instructions on how to complete your application. When complete, your application will be sent to the NYCB Board for approval. 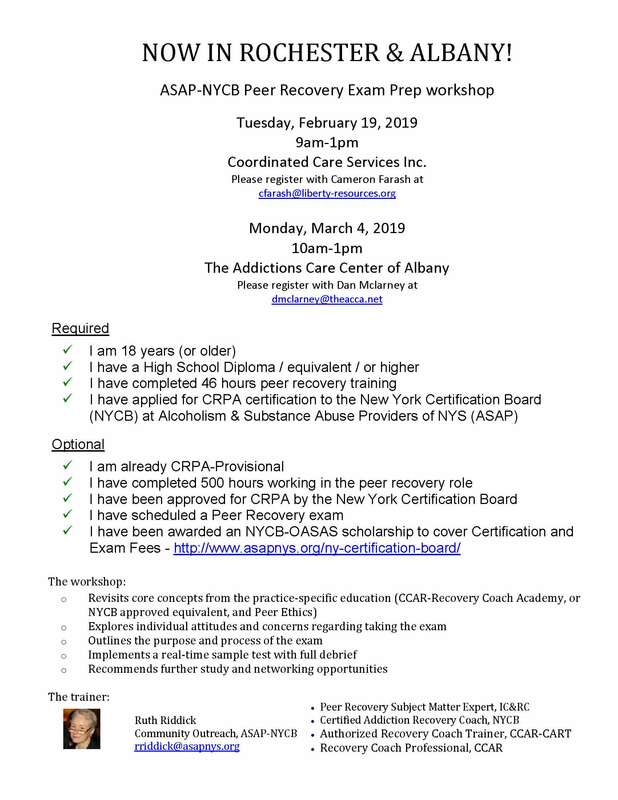 Once approved by the NYCB, your certificate will be emailed to you. The CARC exam has been temporarily suspended, and is not required at this time. However, the CARC exam will be reintroduced in 2018, and timely notice will be posted on this website. Your CARC certification dates from the 1st of the month and is valid for 3 years. 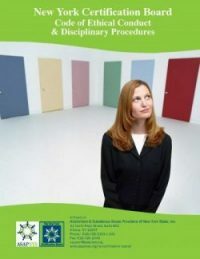 Please click here for details of recertification standards and procedures. 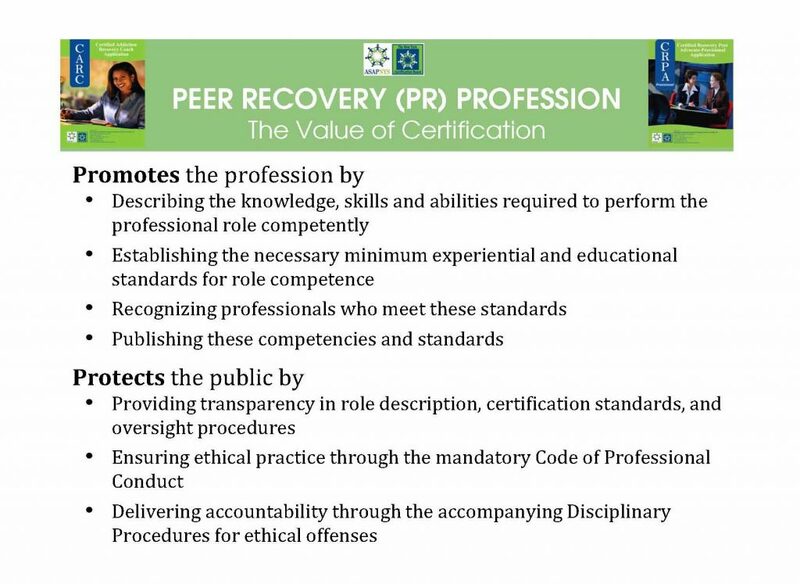 Please note that CARC confirms educational and ethical standards of the role and the certification holder. 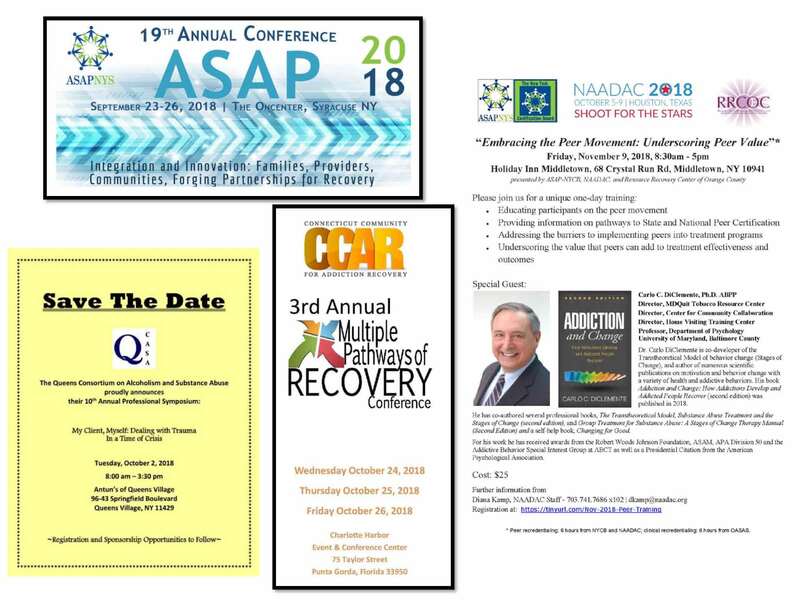 CARC is not a Medicaid-billable platform. Fees must be paid in advance of the exam. Candidates are subject to IC&RC’s Reschedule/Cancellation Policy – click here for details. Please note that fees are valid for one year only from receipt of a certification application. Incomplete applications will be considered “Inactive” after a year, and are subject to additional fees in order to proceed. All NYCB fees are non-refundable. 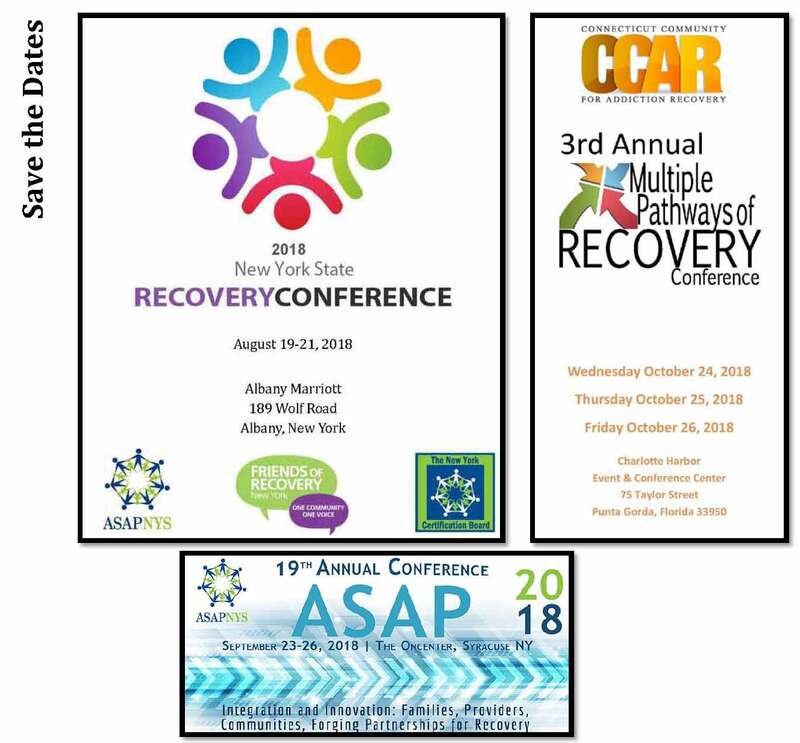 Candidates must submit all renewal requirements: that is, completed online application and training documentation showing completion of 28 hours of continuing education. Candidates must also take the 46 hours of foundational training again. The training used for original certification is ineligible. Pay the standard renewal fee of $100 AND $100 late fee. Candidates are not required to re-take an exam. 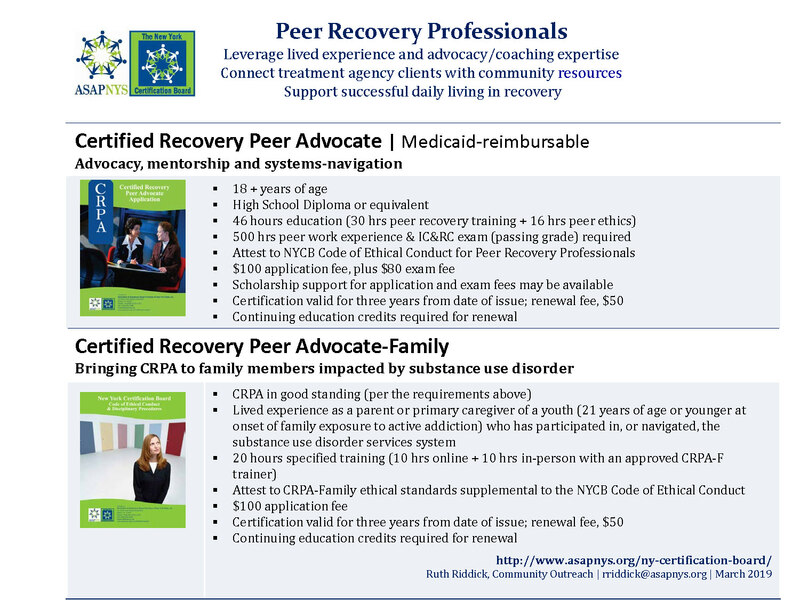 Click here to upgrade to Certified Recovery Peer Advocate!